When rolled up, Roll-a-Table occupies a space less than 4% its set-up size! This space saving design comes from its unique 11 segment roll-top where the segments are cut progressively larger so that they nest together perfectly from one revolution to the next. And because there are no bulky X-braces, you get a table that rolls-up into the smallest size possible. All materials in Roll-a-Table are chosen to complement its unique design. The aluminum comes from Alabama. The 11 segment roll-top is made of a select grade of "Ultra-Core™" laminated wood from Montana, that is completely covered by a water-resistant fabric. All fittings are zinc plated steel and Camp Time® does all its manufacturing in Spokane, Washington. SPECIFICATIONS: Roll-A-Table is a 10 lb bundle that carries and sets up easily! 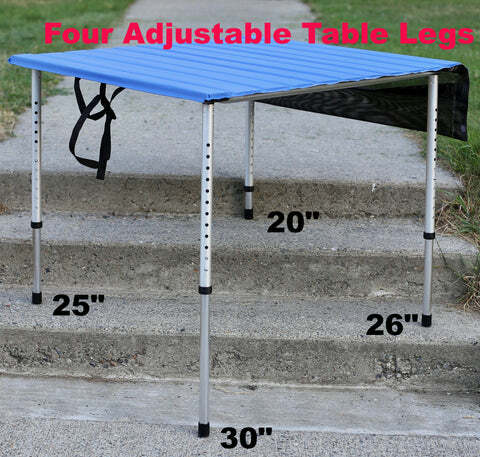 Set-up size- 32"x32"x28", rolled-up size- 32"x5.5"dia, capacity 100 lbs, Color- Royal Blue Roll-Top with aluminum legs. Four telescoping aluminum table legs provide leveling on irregular ground, Each leg has a spring button that positively engages one of 12 separate height-adjusting holes for a total of 12 table heights including: 19", 20, 21,22,23,24,25,26,27,28,29,30"... Legs adjusted to 30" length are much more flexible than those adjusted to 19" length. When using the adjustable legs above 28", provide additional table stiffness by strapping two tables together or bracing the table against a wall/tree, or pushing the table legs into the sand.